Small, but powerful. Petite, but roomy. Little, but holds lots. The 2018 Volkswagen Golf is full of surprises since most people wouldn't expect a subcompact to perform with such accuracy and dynamism. "The Volkswagen Golf is one of our favorite cars to drive. A frequent recipient of our 10Best Cars Award," said Car and Driver in its review, which, by the way, gave the Golf a 5-star rating. Read on to discover everything that's new in the 2018 Volkswagen Golf, then click the button to schedule your test drive at Southern Greenbrier Volkswagen. Plus, get the Southern Hospitality Buyers Program with a lifetime of benefits; such as oil & filter changes, VA state inspections, loaners and much more. The 2018 Volkswagen Golf is the perfect vehicle for every Jane and Joe who has a daily commute and weekly chores, but who enjoys trekking the back roads on the weekend. The Golf offers excellent handling, accurate steering and nimble cornering. It may not break land speed records, but its acceleration is on a par in its class. The Golf, which comes in a 3-door or 5-door hatchback, offers a base 1.8L turbocharged 4-cylinder engine that outputs 170 HP and 184 lb.-ft. of torque with a 5-speed manual or automatic transmission. When you're considering a subcompact car, legroom is of the utmost importance. The 2018 Volkswagen Golf offers plenty for both the front and the back. Front-seat passengers have 41.2 inches of legroom and back-seat passengers have an impressive 35.6 inches. In fact, Car and Driver tested the back seat with a passenger taller than 6 feet who found the back seat comfortable and easy to get in and out of. For the 2018 model, Volkswagen upgraded the Golf's infotainment system. It offers a 6.5-inch touchscreen (although an 8-inch is available) with digital buttons replacing the plastic buttons from prior years. Your safety and that of your passengers' is of the utmost importance to Volkswagen and to Southern Greenbrier Volkswagen. That's why the 2018 Volkswagen Golf offers all the coveted active safety features to keep you safe, alert and in control. Just as important is the fact that the Golf received excellent ratings from both major safety rating agencies. 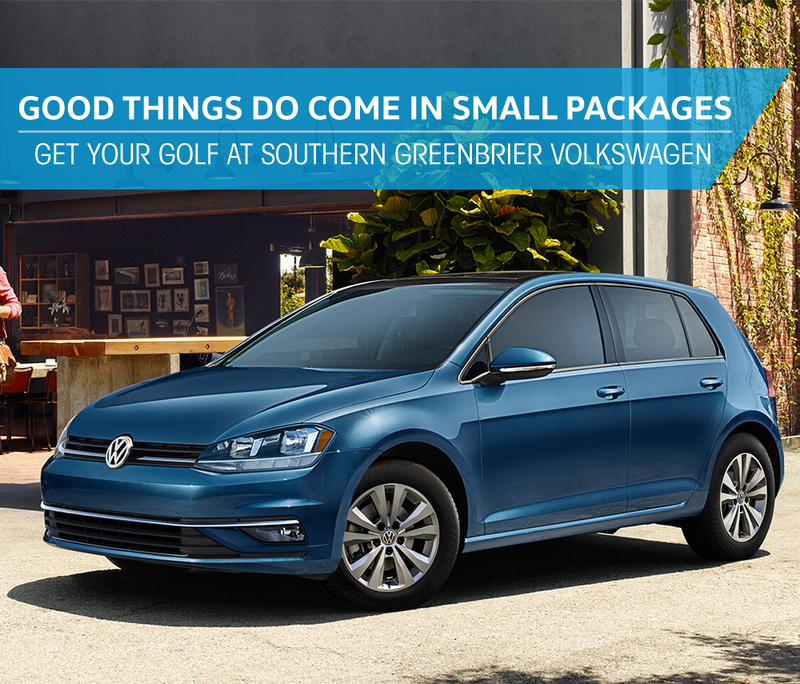 Now that you have read why the 2018 Volkswagen Golf is the perfect subcompact car for Chesapeake, and its surrounding areas, stop by Southern Greenbrier Volkswagen and test-drive one today. Don't forget that every vehicle comes with the Southern Hospitality Buyers Program. Discover our rock-bottom prices, easy financing and a hassle-free experience. Visit the place where it's all about you, period!